Strictly Briks wants to thank everyone for making our event in November a huge success! We are offering a 20% off coupon on Strictly Briks Website just in time for Christmas, plus offering the Giant Christmas Gift giveaway! Creativity has its base with Strictly Briks®: Let your imagination run wild! Our products allow you to take your building to a whole new level. Quickly and easily build a tower, a skyscraper, parking garage, castle, or other structure that stands out above the rest! Unlike other brands, this unique base plate has a bottom that is designed to be stacked and combined with your existing bricks for tons of different construction possibilities. Stack em' up! 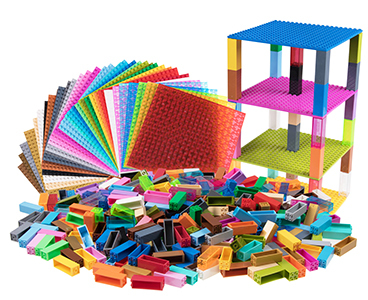 Giveaway Package Includes: Brik Tower 10"X10" (36 Pack), Brik Tower 6"x6" (36 Pack), Race Track, AlphaBriks & MathBriks, Silicone Mat, 1000 Piece Set of Space Colors, 10 Pack of Baseplates, Trap and Gaps (4 Pack), AND Unique Shapes (12 Pack)! Apply to Enter the Giveaway!